And the lack of dust in the air is interesting too. 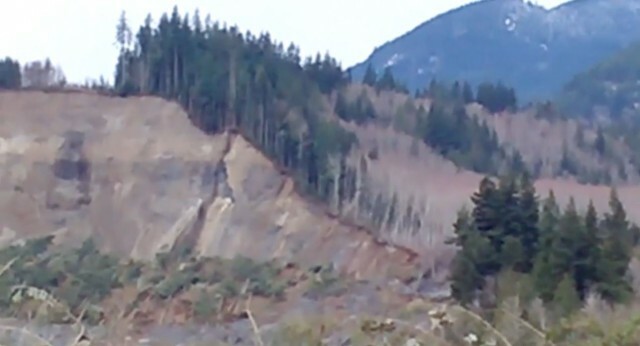 It doesn’t appear to be windy, suggesting that this was probably because the landslide did not generate huge amounts of dust, supporting the idea that the landslide was very wet at the time of the failure. But the most interesting aspect really is the sense of calm. You might think that in the aftermath of the landslide everything was very chaotic, but this video shows a shockingly tranquil scene. There is a news report about the video on K5, which includes some additional footage, in particular showing the rescue efforts that were going on at the time. The small number of fire fighters, survivors and passers-by had started to try to rescue people caught on the edge of the landslide. Of course at this point the main rescue teams had not arrived. Apart from these well-organised rescue attempts – I have massive admiration for these first responders, who had to deal with a dreadful situation, and coped wonderfully – it would be impossible to know that the landslide had just occurred. Shortly after this slope failure, I put together a couple animations using aerial imagery. So interesting to see the landscape trying to find a new “stable” formation. I find myself wondering what this will look like in many years to come and being a case study of an “Oops we probably knew we shouldn’t build here” scenario. This is what learning is about and this progressive failure shows us where we should be looking on sites of older failures.